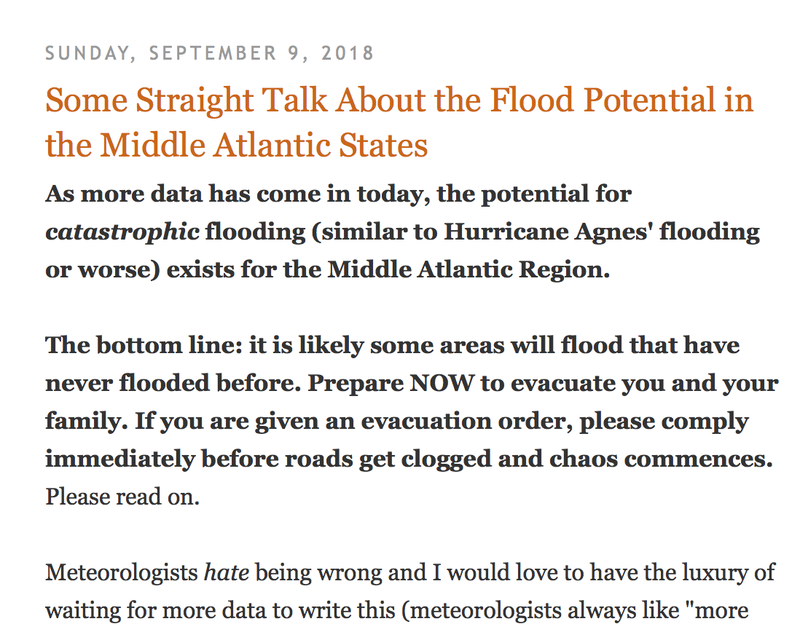 MSE Creative Consulting Blog: How Bad or Good Were The Forecasts for Florence? 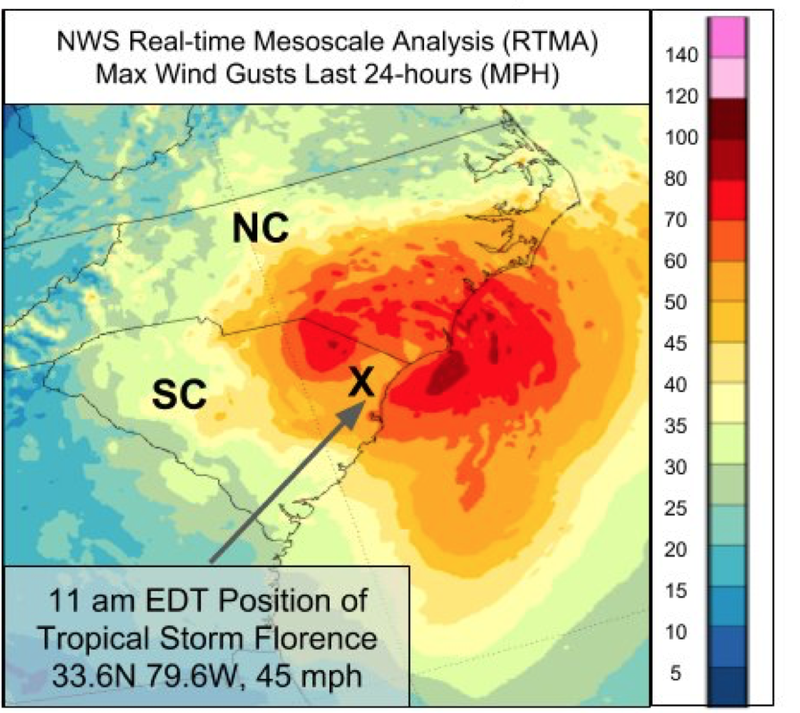 The forecast location of landfall of the eye of Florence was extraordinary. Incredibly good; a major step forward for weather science. 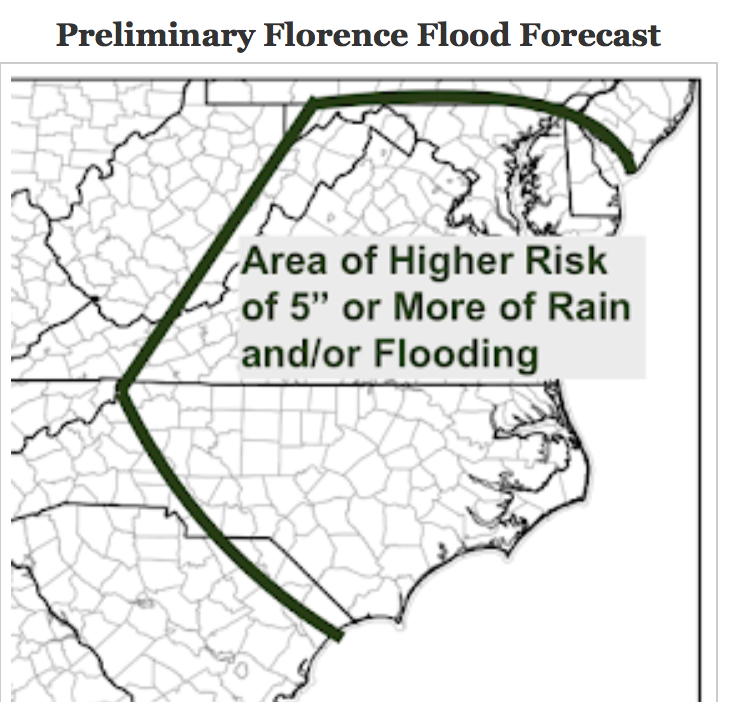 The forecast of the record flooding rains. Again, excellent. The forecast of maximum wind speeds was "fair." Yes, it was a significant hurricane but the initial wind speed forecasts were too high. The forecast location and magnitude of the storm surge forecasts were good to very good. So far there have been seventeen reported deaths and "900 lives saved" due to rescues. The latter suggests the evacuation orders and the forecasts were not as effective as they should have been. It also suggests that, without good forecasts, the number of deaths could have been 1,000 or more!! 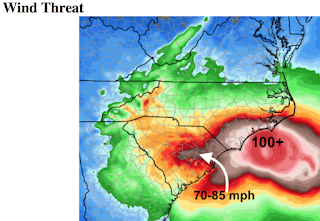 Here is the Sunday forecast of landfall presented on this blog. 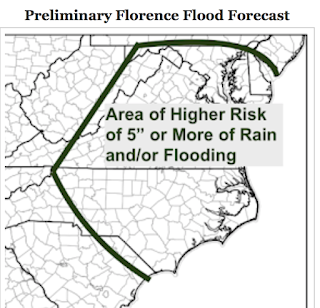 In this case, it is the NHC forecast. That is essentially a perfect forecast except that it was about six hours early. I was essentially using their forecasts with some slight damping out of changes due to model overcorrections at times. There is a 15+ year old estimate that each mile of coast under a hurricane warning costs $1 million (doesn't account for inflation). 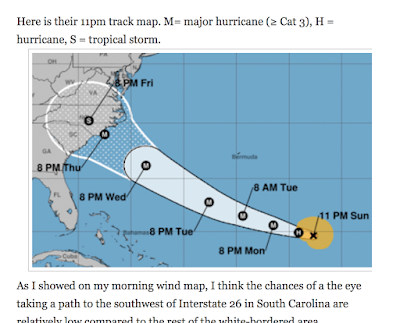 So, if a hurricane warning takes up 50 miles of coast, the preparation cost is $50,000,000. 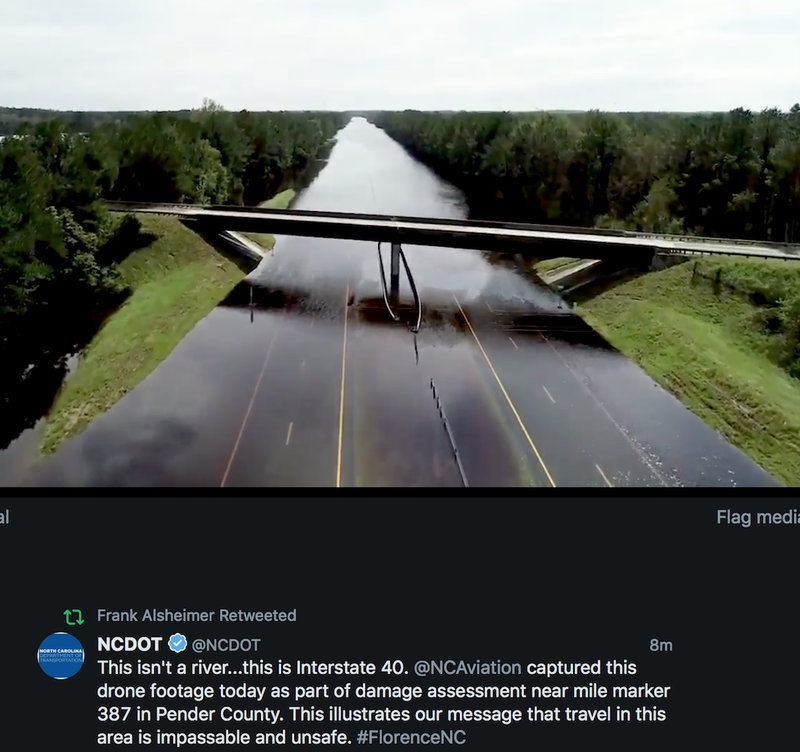 The actual hurricane warning was small enough that perhaps a $100,000,000 in unnecessary precaution costs were averted compared to the width of the hurricane for a similar storm 20 years ago. 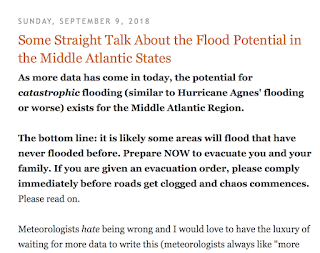 Please see my post, The 700,000,000 Forecast, for more on this topic. On Sunday afternoon, I posted the item below forecasting record rain and flooding. I was sticking my neck way out but I wanted to give my readers time to prepare. Nearly ten thousand read it. 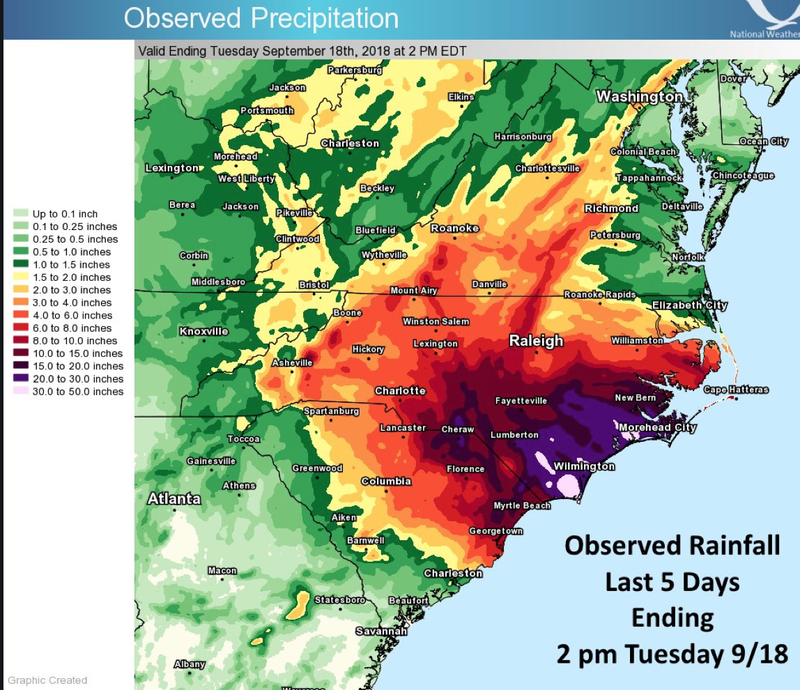 Here is the actual rainfall (note: this was updated Tuesday, 18th, with later information). I believe you will agree the match is excellent, especially with a forecast made four days in advance of the beginning of Florence's rains. The forecasts got better from here. The flooding has been extreme. 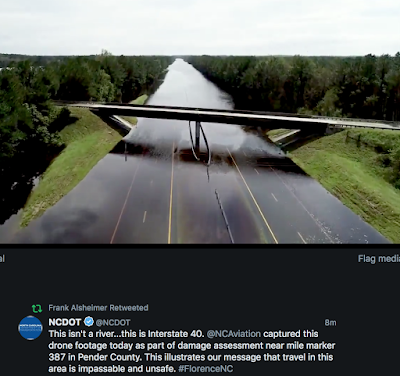 Below is an image of Interstate 40 taken earlier this afternoon. Here is the forecast I posted Monday. Here is Tuesday's wind speed forecast. I revised it down but not enough. Here is the forecast I posted Thursday (day before landfall) that was quite good. There was a 119 mph wind gust reported right off the coast. 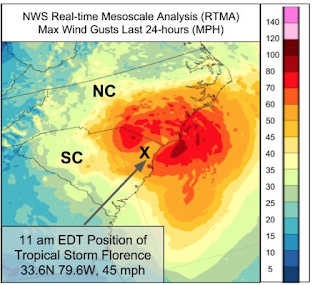 Here is an analysis of the actual wind gusts from Florence. 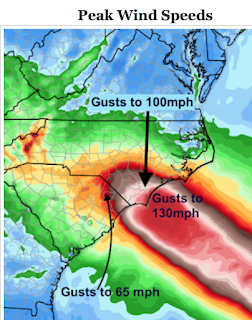 You can compare this to the wind gust forecasts (above). 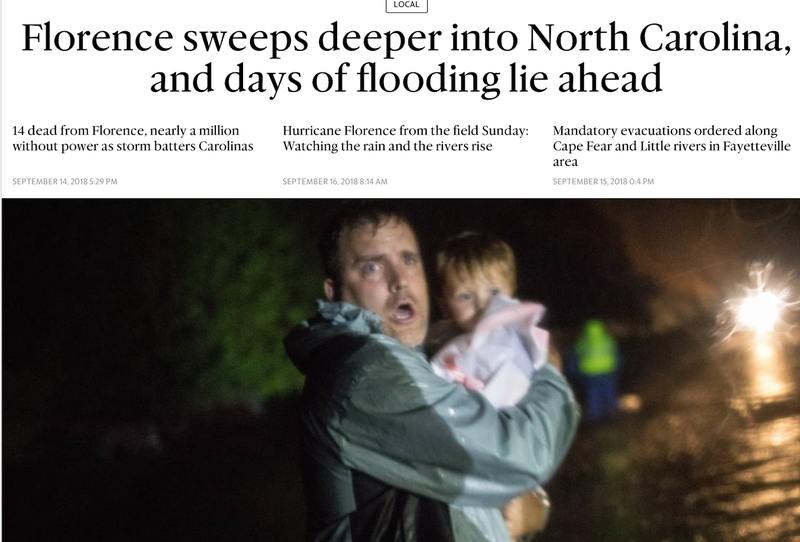 Florence weakened more quickly than expected which accounts for the overforecast of wind speeds. 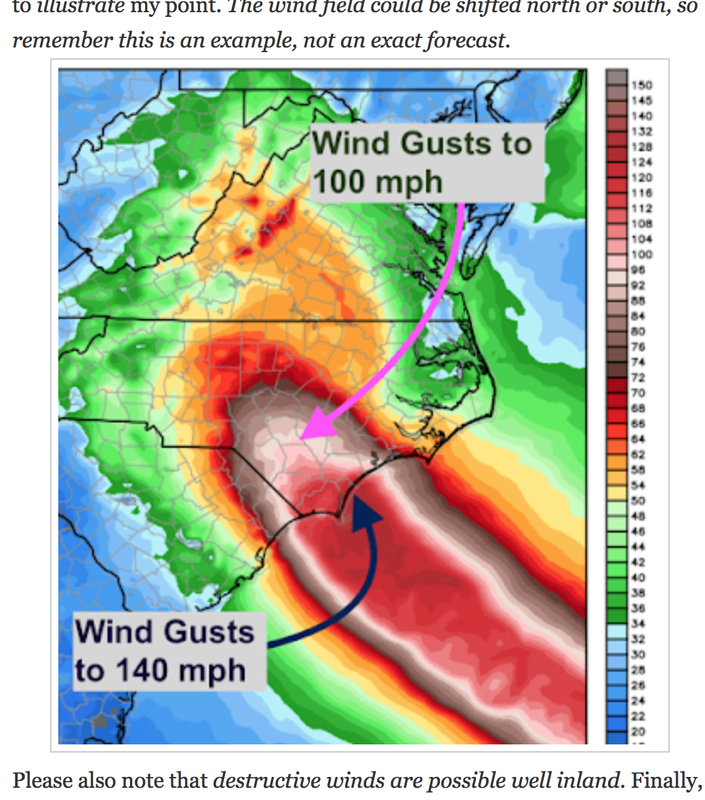 Wind speed forecasting is the weakest part of meteorology's forecast abilities when it comes to hurricanes. Preliminary indications are that the storm surge forecasts were good. The USGS and NOAA are out measuring that now. Weather science has done an amazing job the last 15 years when it comes to improving both the accuracy the utility of storm warnings. The beneficiary is the people of the United States and our economy. ADDITION: My friend, Dr. Bill Hooke, wrote about this same topic on his blog this morning. It is here.